The best learning happens when children are actively engaged in investigating their own ideas, trying new things, experimenting, deepening their thinking, cooperating with each other, solving problems and conflicts, figuring it out. The problem is, young children aren’t very good at things like sticking with one idea over an extended period of time, communicating what they’re thinking about, listening to others’ communication—all skills that are pretty central to the learning that happens through play. Our job, as teachers in a child-centered, play-based school, is to help scaffold children in those skills, so that they ideas they bring to play can grow and expand and be shared. The trick is to provide enough scaffolding that children are successful in their work and play, but not so much that we’re taking over and making the play about OUR ideas. Another time I might say, “Show me how the machine works,” but I sensed I had pushed it far enough with my first two questions, so I decided to run with his idea and see what happened. “The machine makes noises? Cool!” I said. I started pressing “buttons” and making noises. BEEP! WHOOSH! A-OOGAH! The child laughed at the last noise, and reached down and pressed the same spot with his finger and said A-OOGAH! We started taking turns using the noise machine to make different noises. Other children were starting to come over. I knew the child I was working with would have a hard time getting other children involved, so as each new child came over, I said, “Hey, we’re building a noise machine! Look how it works! BONG! 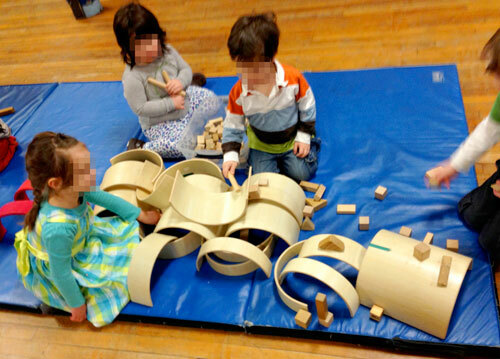 Come help us!” Soon there was a small group adding blocks and experimenting with noises. After a little while the game drifted to new topics, as games will do. But I felt good that I could help one child take what could have been a throw-away idea—the noise machine—and turn it into something that kids could spend 10 minutes cooperating on. 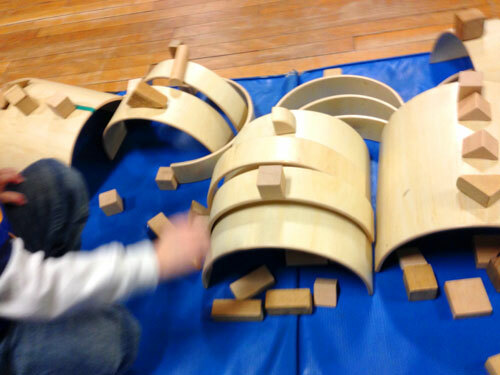 Sometimes I use too heavy a hand, and find myself at the center of play that depends on me—the kids aren’t doing enough of the work. Other times I don’t step in enough, and a promising idea fizzles because a child couldn’t explain it to another, or because they couldn’t keep their attention on it. 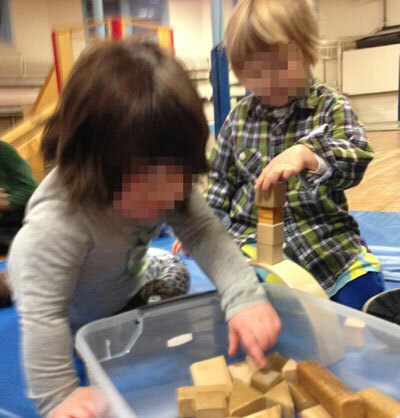 But this particular time it worked just right, and I saw some two- and three-year-olds level up their listening and teamwork skills, just a little bit, for the sake of staying involved in a cool game.